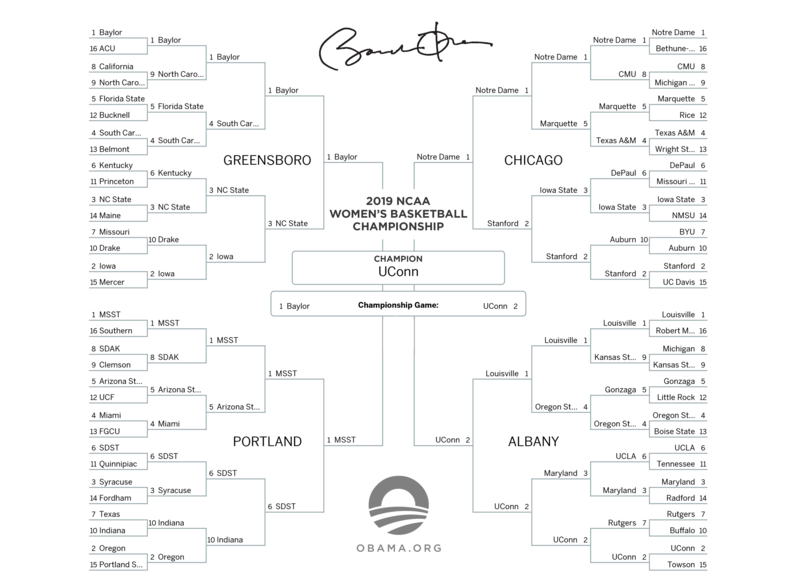 Former President Barack Obama revealed his brackets for the 2019 NCAA men’s and women’s basketball tournaments on Thursday. And while he only has two No. 1 seeds in his men’s Final Four – fewer than he’s often had in the past – his title picks are as unsurprising as can be. 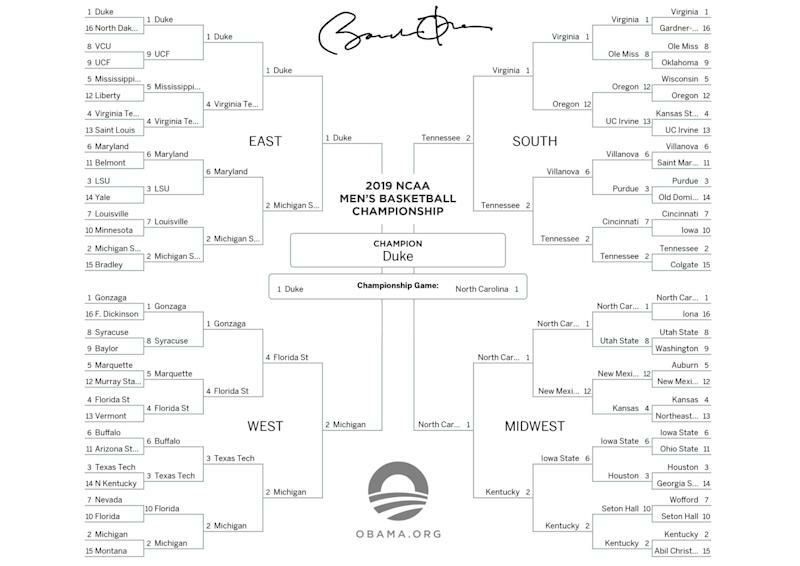 Obama, continuing his “presidential bracket” tradition that current president Donald Trump won’t continue, published his brackets less than an hour before the start of the first round of the men’s tournament. Since the first March of his presidency, Obama is 2-for-10 on men’s championship picks and 5-for-9 on the women’s side – which, all told, is a pretty darn good percentage. 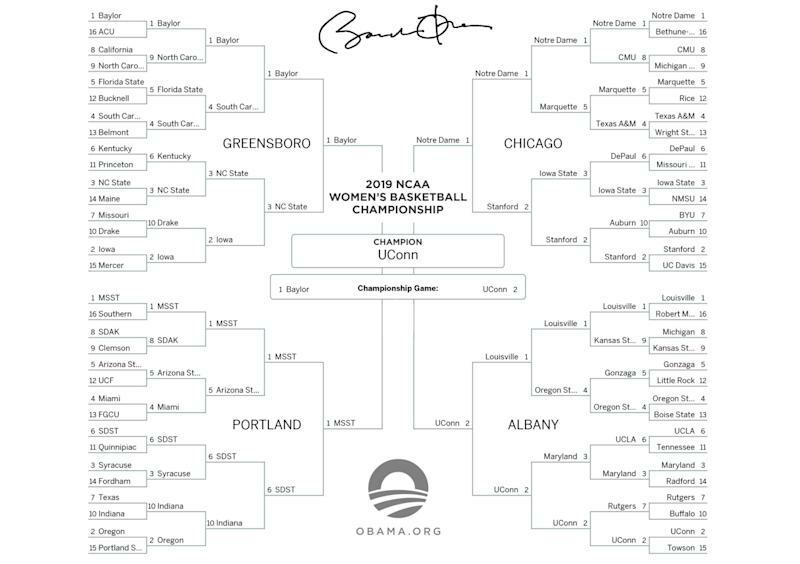 Obama has now picked the UConn women eight of the past 10 seasons, and Baylor the other two. He’s been right more often than he’s been wrong. 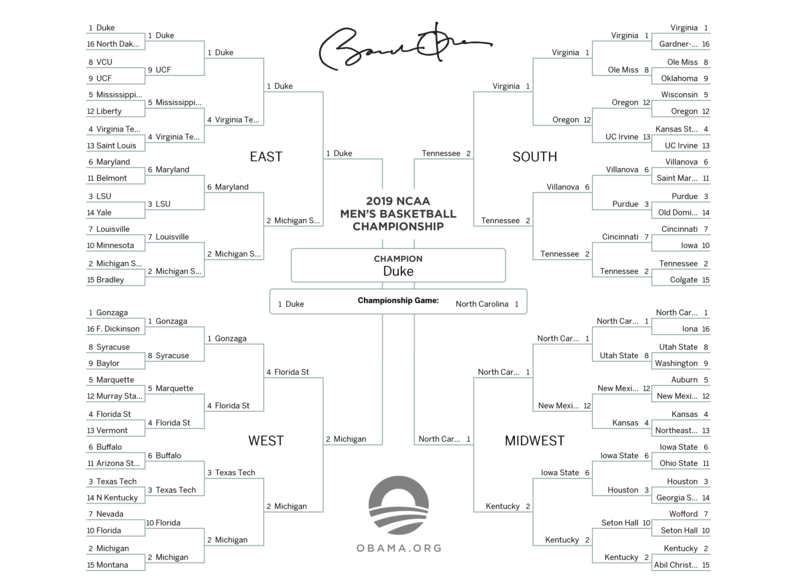 In his men’s bracket this year, Obama, for the first time, is picking Duke to win it all. In the past, he’s had associations with the North Carolina program, memorably practicing once with Tyler Hansbrough’s Tar Heels. 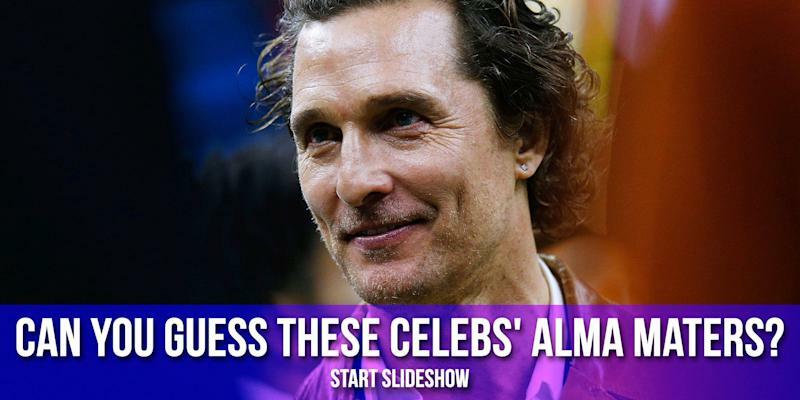 But he attended this year’s Duke-UNC game at Cameron Indoor Stadium to get an up-close look at Zion Williamson – only to see Williamson exit with an injury after blowing through his shoe. Duke is the most-talked about team in college basketball, and by far the most popular Final Four and national champion pick among Yahoo users. The Blue Devils are also Vegas’ favorite. So it’s not surprise Obama has them cutting down the nets. The rest of his men’s Final Four is Michigan, Tennessee and North Carolina. As for upsets, Obama has New Mexico State beating Auburn and Kansas, UC Irvine and Oregon both winning their first-round games, and Florida State beating Gonzaga in the Sweet 16. On the women’s side, Obama has three No. 1 seeds in his Final Four: Baylor, Mississippi State and Notre Dame. But he has UConn as his champion despite the Huskies not earning a No. 1 seed for the first time since 2006.